For me, Children of Blood and Bone is a book that almost lived up to the hype. That said, I wouldn’t say I was too disappointed, since I still enjoyed myself, though I do wish some aspects of the story could have been handled better because otherwise this would have been a near perfect read. At its heart, the novel focuses on two sets of siblings. Zélie Adebola and her brother Tzain are of the Maji, hailing from an island nation where their people revere the life and ocean around them as well as the magic in their roots. Those who are born with white hair are known as Divîners, gifted with the power to do incredible things. But ever since King Saran of Orïsha outlawed magic and targeted the Maji for death, Zélie has been living a life of bleakness and oppression, facing harsh abuse and insults simply because of her features that mark her as a Divîner. But even though magic has all but disappeared in her world, the fire in Zélie still burns, fueled by the memories of her mother before she died in the king’s brutal genocide. Divîners are also subjected to outrageous taxes merely for existing, so in order to prevent her family from going into debt and living in servitude for the rest of their lives, Zélie heads into the city to trade, only to find herself caught up in a scuffle at the market. In a twist of fate, she ends up on the run with Amari, the princess of Orïsha herself. The daughter of King Saran, however, is nothing like her father. Caught in the middle of her own escape, Amari teams up with Zélie to avoid capture by Prince Inan, who has been tasked by the king to bring his wayward sister back. Our four young protagonists—Zélie and Tzain, Amari and Inan—soon come together in a desperate gambit to return magic to the world, following the surprising discovery of a mysterious artifact that has the potential to change everything. Children of Blood and Bone started off well, but the story hit a few rough patches after the introduction and before we reached the climax. I find that a lot of debut authors struggle with pacing, which is why I wasn’t surprised to find some of these issues leaking in once we approached the halfway mark. At this point, I also felt that Tomi Adeyemi became a little too self-indulgent when it came to her characters, and maybe someone should have come in with fresh eyes and an editing pen to trim back some of her more awkward attempts to be dramatic. There are a lot of remarkable and uncommon ideas in this book, so to have some of that uniqueness spoiled by a handful of stupid YA romance tropes was such a shame. It’s frustrating as well because the characters were well on their way to showing exceptional promise, yet the author ultimately felt the need to create artificial conflict in their relationships, and she ended up doing it by turning to the same tired tricks. Overall, characterization was also great but sometimes it got a little shaky at the personality level. The story is told via multiple POVs and sometimes I would find myself forgetting whose chapters I was following, especially when it came to Zélie and Amari. On the one hand, I feel as though this shouldn’t have been surprising, since the story features two brother-and-sister pairs and hence the occasional moment of confusion is to be expected, but on the other, shouldn’t there be a starker difference between the voice of a Divîner who has spent her whole life subjugated versus that of a princess who grew up surrounding by royal luxury? Sure, both characters have faced individual hardships, but mixing up the two shouldn’t have ever been an issue. While minor hitches like that ended up slightly dampening my enthusiasm for this novel, on the whole it was still a very good read. The praise is well deserved when it comes to some aspects like the world-building and magic which is genuinely one-of-a-kind and unexpected, but in terms of characters and plot, I didn’t find enough in them to become truly excited. It’s a common trend in YA I’m finding these days, where I’ll love the world and the lore but find myself feeling less enthusiastic for the story and protagonists because I want originality in the relationships and plot developments as well (or maybe I’m just asking too much). Things also dragged in places and generally the book was probably a lot longer than it had to be. 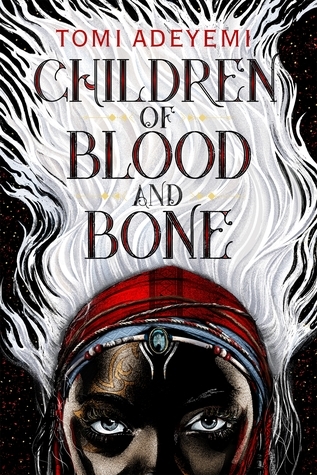 Children of Blood and Bone didn’t quite live up to the hype for me, but by and large I think most YA fans will adore it, so if you are curious about this one, you should try it. I can also understand why a new author might want to use certain popular tropes and play it a little safe with a first novel, but with her talent for world-building and the loveliness of her writing style, I think Tomi Adeyemi will be bringing much more to the YA genre after getting her feet wet with this debut. Audiobook Comments: This was my first experience with the incredible Bahni Turpin as a narrator, and I thought she was fantastic in her performance. She was also great fit for this book, and by using different accents, voices, and tones she was able to perfectly portray the thoughts and emotions of the characters. I think the audiobook could have been even more immersive with multiple narrators though (one for each character POV), not to mention this would helped with my confusion between some of the Zélie and Amari chapters, but all in all, this was a great listen. I am starting a Kickstarter to make me the Editor of the World. I will personally look at every book before it is published and give it the Yay or Nay. The Worlds Needs This! Even though I don’t listen to audiobooks, I really like that audiobook portion of your review. To me that seems as important as the book itself. I really like your balanced review there. It’s the only one I’ve seen that touches on some of the downsides of the novel. I’m still eager to read it, but it’s good to know there are some snags in the story. Glad to read a cool headed review of this book. Most bloggers having been raving that it’s the best book they’ve ever read, so I’m glad to hear it’s not perfect. Because a perfect book right out of the gate would be weird! Thanks for the review. 🙂 I’ve had this on the wishlist, but I wanted some trusted reviews before I took action on it. Hopefully your library will have it! Really interesting review- I think it gave me a really full picture of what to expect from this book, so thank you! I do get what you mean about debut authors and pacing. Shame it had some of the usual YA romance tropes. It’s a shame this didn’t totally live upto the hype for you, but it’s good to know that it will appeal to a YA audience 😀 Fantastic review! I had only read glowing reviews so far so it’s nice to see a more tempered point of view! Even with the flaws you mentionned, I still want to give it a try and see what I think about this one, I am not usually intrigued by YA after too many bad experiences but this one sounds quite different (even if the romance tropes are annoying 😦 ). Yeah, though on a positive note I think readers who read predominantly YA will enjoy this one! I’ve seen a couple reviews that have been on the more tepid side, but those have all come from readers who read a lot of adult fiction as well. A great review – very fair and stops the hype a little. Stills sounds good and the cover is fabulous. I’d sort of made the decision already not to read this one though based solely on commitments and that pretty much still stands really.